Prime Minister Shinzo Abe and Angel Gurria, secretary-general of the Organisation for Economic Co-operation and Development, have affirmed that using multilateral mechanisms to tackle steel overproduction and other trade issues is important, the OECD chief said Thursday. “Tariffs are the manifestation . . 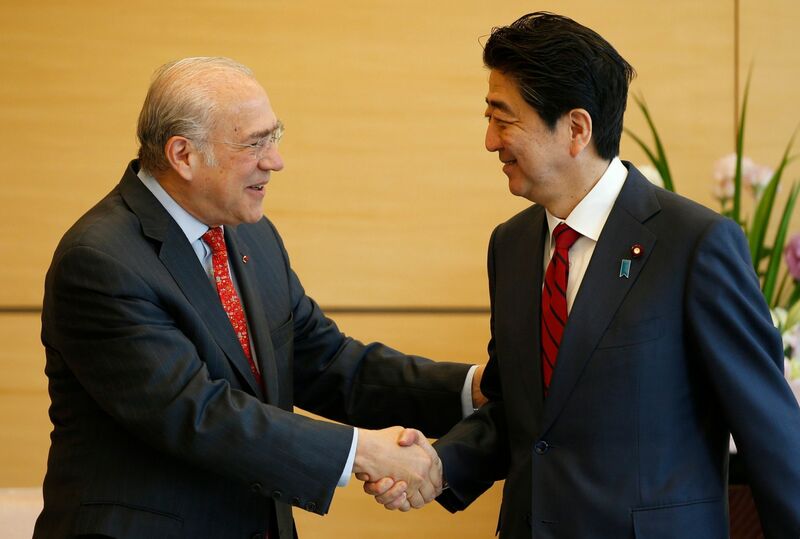 ., but the global forum is the only way in which you can deal with the substance of the problem, and if you do not deal with the substance, you’re going to have a recurrence of the issue … we both agree this is important,” Gurria told reporters after a meeting with Abe. Gurria came to the Prime Minister’s Office in Tokyo to present him with an OECD report, due to be released Friday, containing recommendations that could help Japan continue to grow even as its society ages. Their meeting comes amid a trade dispute between the United States and China that has seen unilateral restrictions imposed, starting with the U.S. government’s imposition last month of tariffs on steel and aluminum imports from China and other countries, including Japan. Gurria said he and Abe concluded that the appropriate mechanism to solve this issue is the Global Forum on Steel Excess Capacity, which was created by the Group of 20 leaders at their 2016 summit in Hangzhou, China, and more broadly that the World Trade Organization is the best place to solve trade disputes. “Amid the spread of protectionism in the world, Japan shares with the OECD an understanding of the significance of the WTO, and we hope to reinforce the multilateral trade system,” Abe said at the outset of the meeting, which was open to the press. 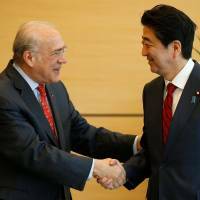 Gurria also hailed Japan’s leadership in creating the 11-party trade pact formerly known as the Trans-Pacific Partnership, that was signed in Chile last month after a revision following the withdrawal of the United States. The new OECD report on Japan, entitled “Promoting Inclusive Growth for an Aging Society,” contains recommendations on tax, health care and long-term care, the labor market, education, innovation, trade and investment, the hosting of sports events and greening the economy. Gurria said he and Abe discussed in particular the need for wage growth, and how the employment market should allow domestic firms to raise wages without losing productivity.